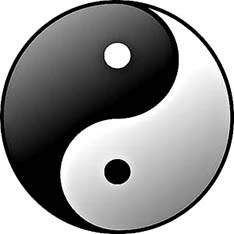 Almost any discussion of Chinese Medicine or philosophy starts with Yin and Yang. You'll see this symbol represented in many ways. I was taught that the image here is the most accurate. In this symbol, yin is represented by the black fish shape and yang the white. One of the first things to learn about yin and yang is that though they are opposites in one sense, they are relative concepts. There is always a bit of yin within the yang and a bit of yang within the yin. The dots or eyes within the fish shape represent this. 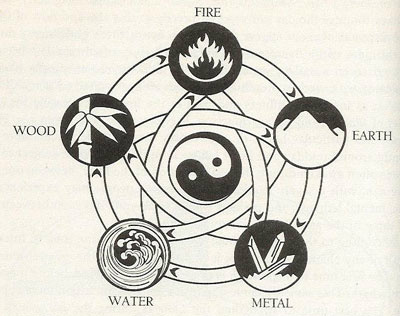 Beyond the concept of yin and yang, there is another model that is very important to Chinese Medicine. Different schools place more and less emphasis on it but you will find it reflected throughout the ancient and modern texts and in the language used to describe the channels (or meridians), the points and the actions of herbs. 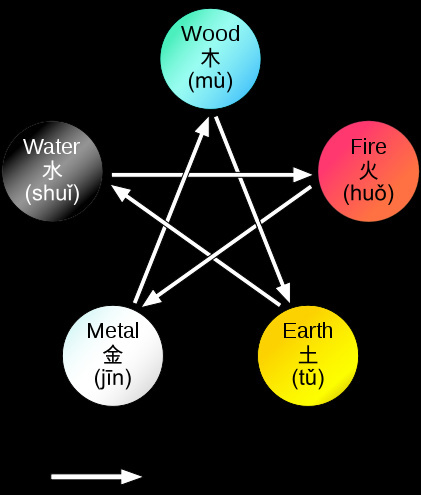 Where yin and yang are timeless and ever-present, the Five Phases may be seen as representing the evolution of a being, the climate of a planet or the wheel of the year, for example. Many images can be found that explicate - and sometimes confuse - this system. Let's look at a few together. This first image is a simple and straightforward as it gets. You'll see Wood on the top with bluegreen, a simplified character for wood and the Pinyin translation. This symbol goes clockwise in what is called the generating or creative cycle around the tips of the star. 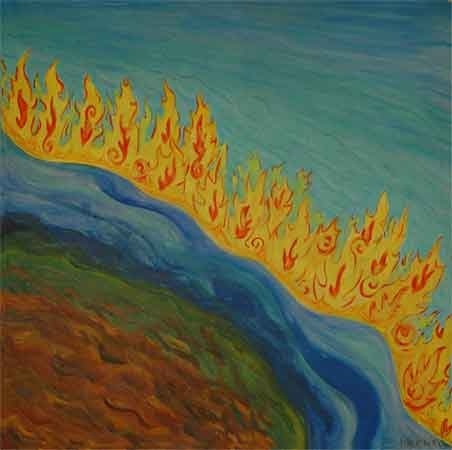 So Wood gives rise to Fire which engenders Earth which begets Metal which nourishes Water. The controlling or inhibitory cycle follows the internal star thus: Wood controls Earth which inhibits Water which tames Fire which smelts Metal which keeps Wood in check. 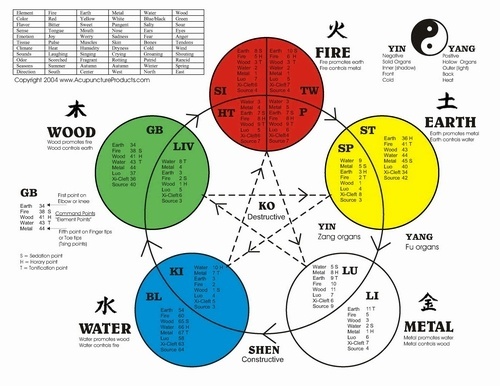 What does Wu Xing mean? I was taught that the word "element" is too static a word to represent Xing. "Phase" implies that it is one aspect of something that changes. A better translation was shared with me by my teachers: "the five walkings in between." Well, that is a mouthful but it makes the point that this whole things is in motion all the time, shifting and changing and becoming. For our purposes, we'll call them Five Phases. This image carries an enormous amount of information in a small space. 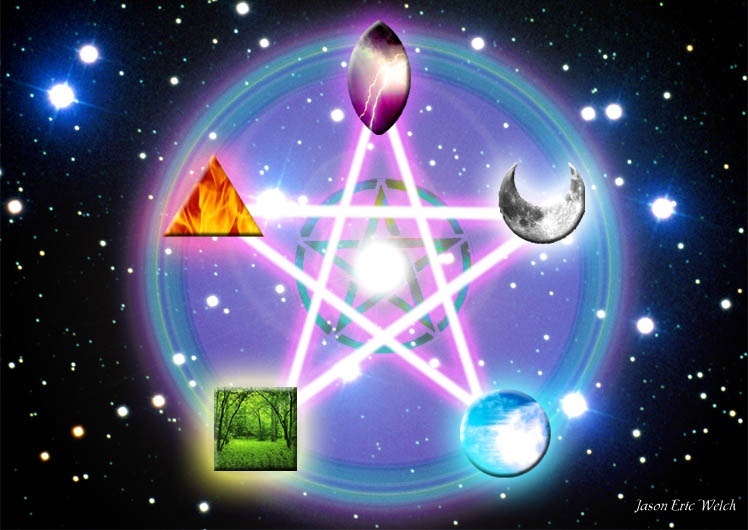 Getting cosmic with the Five Phases.